It’s City Weekly’s fourth Utah Beer Festival, but it’s been a long time since we’ve done an issue that focuses on born-and-bred Utah beer. With three breweries opening this year alone, the timing seemed perfect to check out these new places, as well as remind our readers about the great craft beer that our stalwart breweries have been producing for years. And we have to admit to being a bit surprised by just how much new stuff those breweries—from Wasatch, the state’s first, founded in 1986, to Shades of Pale, founded in 2010—have been up to. No, Utah’s award-winning beer makers haven’t been resting on their laurels (or resting at all—many of the brewers we spoke to for this issue work seven days a week). Instead, they’ve been coming up with new recipes, building communities, reinventing themselves, experimenting with adventurous new projects and putting out more beer in new ways. Sure, it’s all part of business—but it’s clear that their No. 1 goal is to produce high-quality, full-flavored craft beers, from the ubiquitous Cutthroat to tiny, one-off firkin experiments. The craft-beer movement is booming, but as of 2012, only 10 percent of the beer consumed in America comes from craft breweries. It makes you realize how lucky we in Utah are to have such a strong community of local brewers, especially given our oft-maligned liquor laws. You can find locally made beer in almost every restaurant and bar in the state, and these wholly unique brews are truly the flavor of Utah. So, sit back and enjoy this beer issue. We recommend pairing it with a local beer of your choice—you’re going to get thirsty. What’s on tap at the state’s three brand-new breweries. 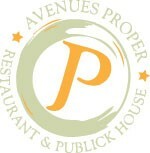 The first thing you notice about the Avenues Proper beer list is all the beer they didn’t brew. While most brewpubs naturally focus on their own product, the Proper provides a curated selection of some of Utah’s best beers, bottled and on tap. 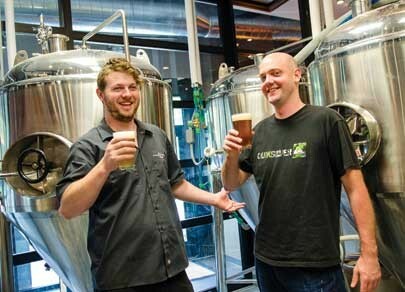 “If someone comes in who’s not familiar with Utah beers or from out of state, they can have a really good sampling of everything Utah has to offer,” says general manager and co-owner Andrew Tendick, who started the micro-brewpub with Rio and Liam Connelly, brothers who serve as brewmaster and chef, respectively. A longtime homebrewer, Rio learned production brewing under Kevin Crompton at Epic Brewing, where they brewed more than 40 beer styles and started a barrel-aging program within the first year. “I don’t think I could have had a better training to prepare me,” Rio says. He wanted to continue Epic’s ethic of using the highest-quality ingredients, but also work at a slower pace at which he could spend more time perfecting his recipes. The Proper continually rotates its four taps with a variety of styles, some common and some rare, especially on draft, due to Utah’s alcohol-content restrictions. Past and present highlights include a Belgian patersbier trappist ale, a Belgian brown and two delicious nitro ales: the Sláinte Stout and Oatmeal Red, both of which have a nice complexity on top of their smooth, creamy mouthfeel. The Proper’s most unusual beer to date is Gose the Gozerian—possibly the first gose to be brewed in Utah. The unusual German style’s aggressive, salty-sour taste won’t be for everyone—my server told me that women sometimes have to finish their boyfriends’ pints—but it’s undeniably unique. Just as you enter Tooele proper, you’ll be greeted by Bonneville Brewery on the west side of Main Street. Before the pub itself opened to the public in March—in a completely gutted, newly renovated space that used to be a rundown bar—beer production started in October 2012. Since Bonneville Brewery owner Brad Shepherd also owns All Star Bowling, that’s where the beer was originally available in late 2012. Today, Bonneville Brewery is an expansive two-floor, family-friendly space—all ages are welcome downstairs; upstairs is 21 and over—with black & white photos from the ’30s and ’40s on the walls that pay homage to the brewpub’s namesake, the Bonneville Salt Flats, and its historic speed-record racing. “Once we chose the name Bonneville Brewery, that sort of just emerged as a loose theme,” says head brewer Dave Watson. The legacy of the Bonneville Salt Flats is also reflected in the names of Bonneville Brewery beers, such as Sir Malcolm’s Stout, named after a famous British land-speed record holder. Motorcyclist Rollie Free, for whom the Free Roller Pale Ale is named, is also immortalized in a photo of him at the Salt Flats that hangs near the bar. Another source of inspiration for naming the beers is local geographical features, such as the Silver Island Hefeweizen, named for the Silver Island Mountains. All spectacular beer needs an equally spectacular food pairing, which is where the work of Chef Joseph Davis comes in. Featuring burgers, pasta dishes and contemporary American food, Davis’ menu was designed to complement the complex flavors of Watson’s beers. “I knew we were going to get along great when they brought him in and introduced me to him, [and] he immediately started asking me about the flavor profiles of the beers because he wanted to keep that in mind while he was designing his menu,” Watson says. Davis also often uses beer as an ingredient in the food, such as in the Hefeweizen batter he uses to fry certain foods, or even in stout barbecue sauce. “He just has strokes of genius like that,” Watson says. 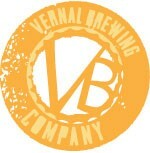 Though they haven’t yet served their first beer, Vernal Brewing owners Ginger and Eric Bowden have been working to bring Uintah County into the beer age since they opened their home-brew supply store The Bucket in 2010. “We got started by homebrewing, and had so much fun with it that we decided we would open a brewery,” Ginger says. Once they had the idea, it didn’t take them long to get going. “It kind of just took on its own life, and we slowly worked through everything,” getting all the permits in place, designing the building and hiring staff, Ginger says. The operation started at the ground level, with Vernal City having to pass an ordinance to allow the brewery to operate—it’s the first brewery in the county. The city was supportive, as Vernal is a huge tourist destination and “people always ask the chamber of commerce if there’s somewhere they can go have a drink with their meal,” Ginger says. The restaurant portion of the brewery is open Thursday through Sunday, serving food and pouring Epic, Wasatch and other local brews. Now they’re getting the brewing equipment in place so that they can soon start serving their own beer, says Ginger, whose favorite style of beer is IPA—the Vernal iteration is called Dinobite. They’ve been developing recipes for about four years.